Your online presence, and what people say about you online, can make or break your brand! 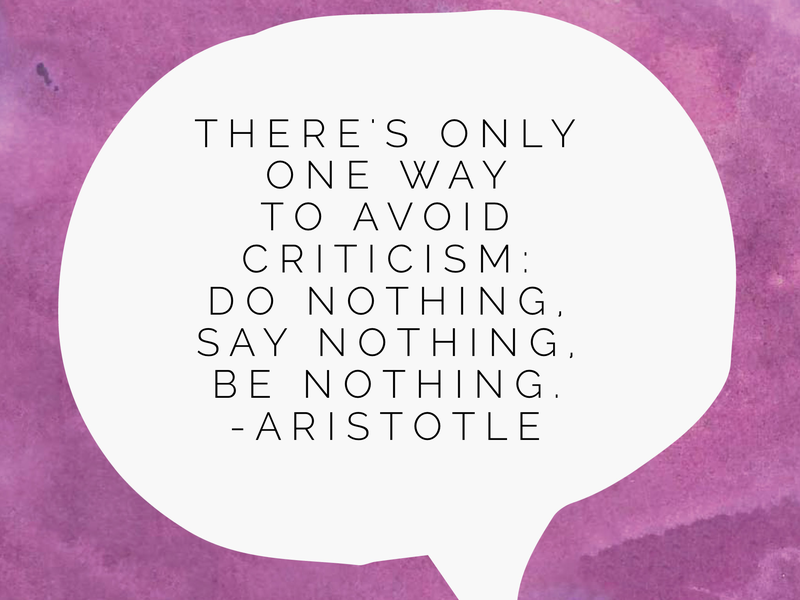 One can’t blame Aristotle for advising a low profile in order to avoid criticism. The Ancient Greek philosopher, renown for his wisdom, could not have envisioned the Internet and the importance of branding, online reviews and customer service have on one’s personal or business reputation. Today, an angry customer or a handful of disenchanted patrons can wreak havoc on your business with a few taps on a keyboard. 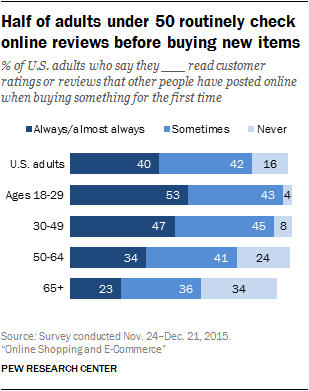 According to Pew Research Center, 82% of American consumers will at sometime consult an online review, and 42% regularly do so before buying a product or contracting a service. Moreover, other research data suggests that of the online reviews read or consulted, close to 90% believe what they read. Any business, with or without an online presence, needs to pay attention. Doing nothing may result in declining sales and cause irreparable harm to a business’s reputation. Some businesses are so concerned with bad reviews, they include a charge to the customer for writing a bad notice, as one British hotelier infamously did. A Yelp reviewer, for example, claims to have been sued by a business over her public review. The paranoid notion, put in place by some buisinesses to censor and control reviews via a monetary penalty is not a well-thought-out policy. Such practices can result in disastrous, notorious, not to mention viral results against the business brand. As a consumer, I look at reviews and consider the totality of all the opinions. I’ve also resorted to social media when I have experienced genuine issues, such as the time one national hotel chain charged me for removing pillows I did not take. After several attempts to resolve the issue via phone calls, I went online to achieve resolution. Read that story here. More recently, I spent months trying to reverse an auto payment for a subscription made from my Paypal account to a national newspaper. Frustrated beyond belief, I turned to Twitter, I tweeted to the paper and within 12 hours, the refund was issued! I also tweeted a thank you when it was resolved. The simple fact is your business will never please everyone. There is always going to be that one client who wants to kick up a fuss, find fault, try to wrangle a refund or a discount. There are no absolutes. Things happen, pieces break off, crack. A server or service clerk might experience a bad day, etc. Nevertheless, a squeaky wheel however, can do damage. If the situation ever gets out of hand and you need to do damage control, there are reputation management services that can help. Create a Google Alert for the name of your business or organization. For a fictional landscape company, “Acme Landscaping” create an alert for the term, “Acme Landscaping Delaware” and add a location “Acme Landscaping Lewes, Delaware” might be another alert. Anytime the terms in quotes gets a mention online, such as a Yelp review, the owner or manager would receive a notification in their email. Google Alerts is almost as good as having a paid social media manager on board. Hire a social media manager. Full or part-time, if you can afford to do so – work witha work-at-home employee who can keep tabs on Google Alerts, online reviews and comments. 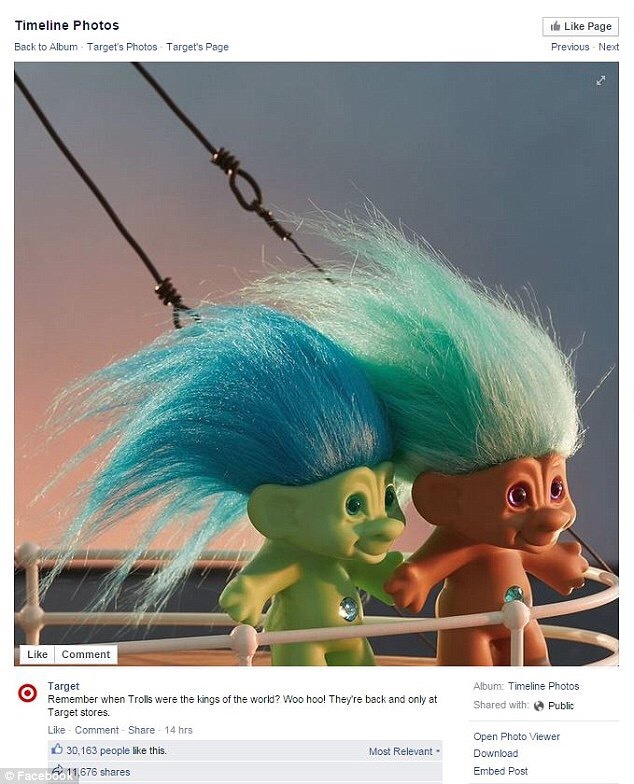 In 2015, one of the nation’s largest retailers, Target, fell asleep at the social media wheel. During a controversy about combining boys and girls toys into one gender-neutral toy section, customers misunderstood the announcement and the reaction was politicized.Confused customers registered their concern on social media, primarily on Target’s Facebook page. Some clever (and I must admit hilariously feisty person) created a new Facebook profile called “Target Customer Service” and another “Ask for Help” and evidently snitched the red and white circle logo and uploaded it as a profile picture, and went about replying to each and every customer comment in an irreverent manner (see an example below). This person went on and on — for days! 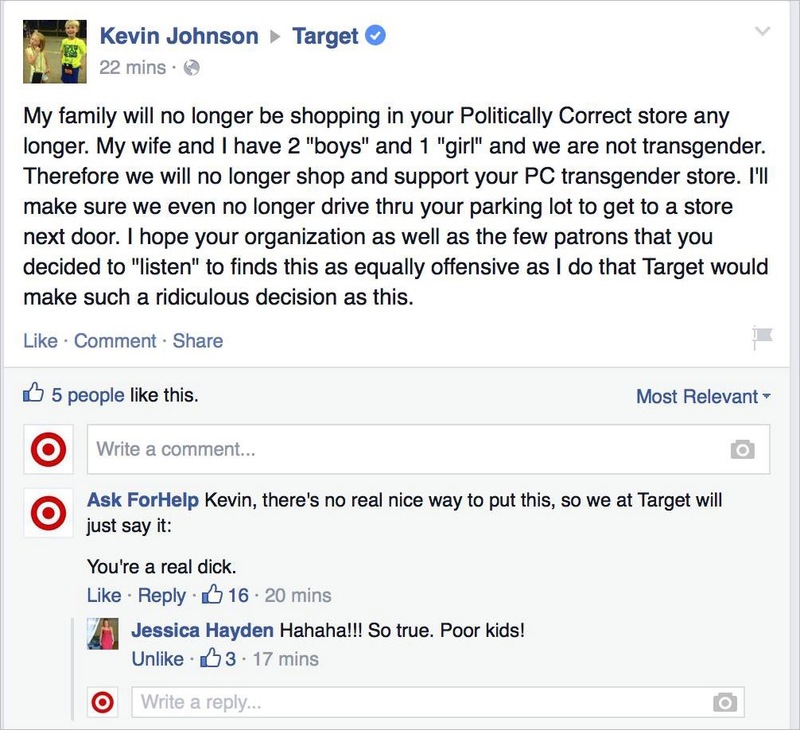 To summarize in, the fake customer service rep told Target customers (in various iterations) to take a hike! The Internet had a field day enjoying his antics. The troll’s response did not have the verified blue check mark, but customers didn’t notice that small detail and voiced outrage at the customer response they received. The authentic Target’s customer phone lines started ringing off the hook, thus alerting them to the problem, which reached viral status. Was there anything wrong? Ask your customers straight away how they feel about their experience with you. Head the complaints off at the pass by asking your customer – in person – at the point of service. Don’t just take their money and send them off. Sincerely convey that their opinion matters and do it sooner than later. Passively asking them to fill out a response card on the night stand, or by asking for feedback with an online survey is not as effective. Those are fine to do, but its best to make a connection at check out — as they hand you their money — and short circuit a percolating issue. Demonstrate with concrete behavior that you really care. As a result, they won’t stew over an issue on the ride home and blast you publically with pent-up anger. Celebrate positive remarks and reviews. Send a thank you. Share it on social media. Consider a feature area in your brick and mortar business where you print out and display positive feedback. Have a testimonial page on your website. Take the conversation offline. In the above example, the best response is to offer a direct way to communicate with the customer and resolve the issue the to the best of your ability. If the issue is resolved to the customer’s satisfaction, ASK, don’t INSIST, they follow up their comment or edit their original review accordingly. Don’t ask them to delete the comment. It’s been seen. The public will think you took it down. People will be watching how you respond. Be a class act. Do not delete comments, exceptions are expletive language or non-sequitur comments about politics, religion or get-rich-at-home schemes that are not germane to your business. Create a “what-if” script for every imaginable scenario. Use it as a guideline and train your employees who deal with the public on how issues ought to be addressed. The script provides a guide from which you customize and personalize a response. Don’t write the same response verbatim and repeat it over and over. You want to deliver an authentic, not canned response, and if possible, a personalized one. 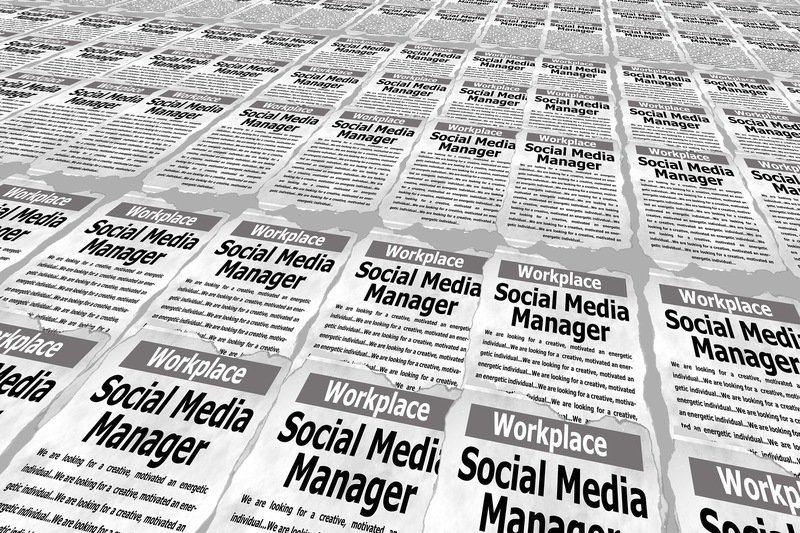 Create a social media policy for staff. Make certain your employee’s code of conduct is crystal clear regarding your brand and how the brand is managed on social media. Have a lawyer review. What can employees say about your brand or business on their own social media accounts? If you have a website, post your mission statement and your business philosophy. Assure that your employees understand this mission and employee ambassadors interact with the public in the voice and tone you have established for your organization. We’ve all seen the horrible receipts shared by customers, created by vendors or waitstaff, and conversely, customers who write awful comments instead of a tip amount. You can’t control what a customer will say, but you can control that your staff understands acceptable or unacceptable behavior. Review and train, learn from mistakes, discuss them, and train some more. Seriously consider a crisis plan for your organization or business. Own and control social media access. Open social media accounts with an email you control. Assure that there are multiple administrators in case an employee leaves for any reason. Control multiple platforms with a management software such as Hootsuite or TweetDeck, which allow employees to post and monitor without knowing the account password. Speak with a consistent voice. First person? Serious, funny, quirky, off-centered? It’s essential to establish the tone and train the staff who represent your brand. Admit the mistake. Commit to improvement. A humble, “Oops, we goofed!” or “Looks like we dropped the ball on that one!” is an authentic and honest response that people will respect. Don’t advertise publicly what you did to make it good. If you decided not to charge, or gave a substantial discount, you might attract imitators. Encourage that customer to publicly voice the resolution. In most cases, a sincere apology and a dose of self-effacing humor go a long way to restoring customer faith and respect. Respond in kind. Someone posts a hidden video at your place of business? Respond with a short video showing your side of the discussion and your values. Use the same headline the detractor used, so when it is searched online, your video will appear alongside it. For example, if someone posts a picture of an employee being cruel to an animal, and that video is going viral, immediately get the owner or a spokesperson up on a video, responding with a heartfelt apology. State the action you took, and the measures you are putting in place to prevent it from happening again. If the content or practice was terrible, acknowledge it. Say you agree and it is unacceptable. Show positive images of your business practices and reiterate your values as an individual and as a company. Business owners, management, customer service reps, consumers are all human and make mistakes. Sometimes the mark is missed. From either side of the transaction, consider the person we are talking to, chatting with online, or interacting with on social media, They might be dealing with a personal crisis, struggle or heartache. Equipment can break down, letters and numbers are misread, weather complicates delivery, a lapse in quality or judgment can occur. Sometimes we hire the wrong person. Sometimes it is in our control, other times outside of our ability to reign in and correct. Most reasonable people know this, but still, we rush and react, often not realizing the consequences. Technology and social media enables us to rapidly spread frustration. Brands, and the livelihoods attached to them are at stake. Brand managers must accept this reality and adapt accordingly. Retain a watchful, vigilant eye at the intersection of customer service and social media where an authentic, trusted brand can thrive or falter. You and your brand will most certainly be judged by how well you respond and react in this ever-evolving social media landscape. This past spring, I traveled to California to attend a week-long conference. For the first time, I flew out of BWI, and so decided to spend the night before the flight in order to be close to the airport. It was well-known national chain, that I’ll call Hotel X. I booked the room through a third party site and got a great rate. Everything about my stay was terrific. I used the complimentary shuttle to go to the airport. I chatted small talk with the front desk clerk. I tipped well. My problem surfaced when I got to California and my husband called to say I had an additional $50 charge on my bill (I had pre-paid). He asked if I had used a mini bar (there was none) or ordered something special. I responded “No” and asked him to check it out for me, which he did. The $50 charge was for the removal of two king-sized pillows that the hotel claimed were missing and “since so many of our guests like our pillows” it is common for them to go missing. If I wanted to buy pillows, I would buy new ones from a store. Not to mention I have a queen-sized bed and standard pillowcases. My bedding is not king-sized. We refused the charge and called the hotel to say the charge was unfounded. Several days elapsed. The front desk clerk checked back, talked to the “director of housekeeping” who confirmed the pillows were indeed missing. The hotel was not going to back out the charge. I was a pillow thief! But I didn’t take the pillows! I had one suitcase, filled to the brim with a week’s worth of clothing, etc. How could I stuff two king-sized pillows in that suitcase? I had talked with hotel staff, with my sole suitcase beside me, while I waited in the lobby for the shuttle. I wasn’t carrying pillows. Nevertheless, they stuck by their charge. Evidently, my suitcase was empty all along. They didn’t know or care that I was flying to California, so no matter that my plot to book a transcontinental flight with an empty suitcase – all to abscond with two king-sized pillows, was a bit far-fetched. Incensed in California, I took to social media. The hotel had a Facebook page and a Twitter account and I posted on both. Under my real name I tweeted “@HotelX BWI street address docked me $50 for 2 pillows I did not steal. Ridiculous!” “Ridiculous” was as strong as I got with language. On the Facebook page I politely elaborated more. I quickly received a comment back and they promised to look into it. They did. Despite the fact that the director of housekeeping stuck to her story, the hotel management immediately removed the charge. Social media worked where traditional complaining and customer service over the phone had failed. Satisfied, I immediately thanked the hotel on Facebook and Twitter for their prompt attention and satisfactory handling of the issue. It is just as important to compliment and praise on social media as it is to complain. It should also be noted they didn’t delete my comment on Facebook.They faced my pillow fight head on. I have other social media customer service success stories. During a kitchen remodel, we were given damaged quartz counter tops. Once installed, they’re not easy to return, so we had several contractors come out and buff, erase and attempt to repair the flaws that apparently occurred in the factory. We went through several weeks as the retail seller, subcontractors, fabricators and manufacturer went back and forth amongst each other assigning responsibility. We had to send pictures, write letters, file claims, etc. and it was still not resolved. As with my pillows, I went on the manufacturer’s Facebook page to tell my story. Within a week, a corporate representative had arranged for a new fabricator and a new counter top. Companies with a keen sense of their reputations clearly know the value and power of customer relations on social media.